“Education is the most powerful weapon which you can use to change the world.” An inspirational and very relevant quote by Nelson Rolihlahla Mandela – a name synonymous to democracy and freedom particularly in Africa by one of the world’s great leaders who left his mark and legacy for the world to see and live by for generations to come. What is it that makes a leader stand out not only among men, but also among his peers? Is it their vision or courage? Or perhaps the ability of the leader to lead where others fear to tread? It is all of those qualities and so much more that took Nelson Rolihlahla Mandela on a life changing journey from the a small village of Mveso, a rural area of the Transkei in the Eastern Cape of South Africa to being South Africa’s first black president in 1994. A journey marked by a continuous struggle against inequality, racism, education and poverty despite being imprisoned by the South African white minority powers in 1963. Mandela’s early life took a significant turn when Chief Jongintaba Dalindyebo, the acting regent of the Thembu people, adopted him after his father’s death. He was 9 nine years old. Having to relocate from the village of Qunu to the more sophisticated environment of Mqhekezweni, the provincial capital of Thembuland, the chief’s royal residence, Mandela was destined for greater things and given the same status and responsibilities as the regent’s two other children. After school, the University College of Fort Hare in Eastern Cape, the only residential center of higher learning for blacks in South Africa at the time beckoned, drawing scholars from all parts of sub-Sahara Africa. 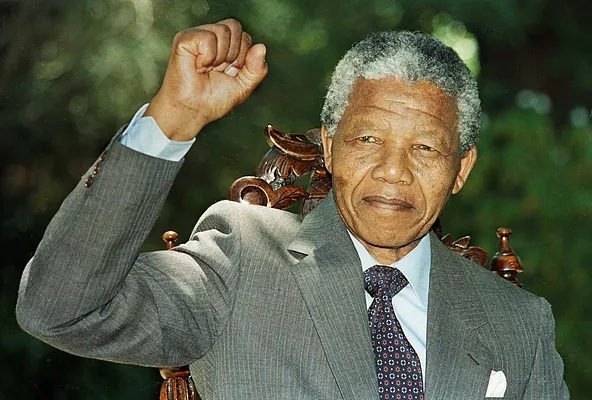 In his first year at the university, Mandela took the required courses, but focused on Roman Dutch law to prepare for a career in civil service as an interpreter or clerk—regarded as the best profession that a black man could obtain at the time. But it was in his second year when Mandela was elected to the Student Representative Council that student politics played a major role. For a while students had been unhappy with the food and lack of power held by the Student Representative Council (SRC). A boycott was launched and Mandela resigned from his SRC position. This was, according to the authorities, an act of insubordination and they demanded he serve on the SRC. The regent, head of his adopted family, was also furious and demanded from Mandela that he recants his position and return to Fort Hare. Seeing this as an act of insubordination, the university’s Dr. Kerr expelled Mandela for the rest of the year and gave him an ultimatum: He could return to the school if he agreed to serve on the SRC. When Mandela returned home, the regent was furious, telling him unequivocally that he would have to recant his decision and go back to school. While back at home he received news that the regent had arranged a marriage for him as was custom but shocked by this news and recent events, Mandela departed from his family home and settled in Johannesburg, working a variety of jobs while completing his bachelor’s degree via correspondence courses and eventually enrolling at the University of Witwatersrand in Johannesburg to study law. Already an independent mind, it was just a matter of time before he joined the African National Congress in 1942. During those early turbulent years in Johannesburg, Mandela was introduced to the realtor and ANC activist Walter Sisulu, who secured him a job as an articled clerk at law firm Witkin, Sidelsky and Eidelman. The company was run by a liberal Jew, Lazar Sidelsky, who was sympathetic to the ANC’s cause. Mandela realized that the ANC’s old tactics of polite petitioning were ineffective and in 1949, the ANC officially adopted the Youth League’s methods of boycott, strike, civil disobedience and non-cooperation, with policy goals of full citizenship, redistribution of land, trade union rights, and free and compulsory education for all children, propelling Mandela to the forefront of a political battle that would see him put on trial for treason and be sentenced to life imprisonment. Mandela soon rose quickly through the ranks of the ANC and in 1950 was voted President of the ANC Youth League (ANCYL) and took a seat on the ANC National Executive. After passing qualification exams to become a full-fledged attorney, Mandela and Oliver Tambo opened their own law firm, Mandela and Tambo, and opened up in downtown Johannesburg. Being the only African-run law firm in the country, it soon became popular with aggrieved blacks, often dealing with cases of police brutality. The firm soon got noticed by the South African authorities and was forced to relocate to a remote location after their office permit was removed under the Group Areas Act – a cornerstone piece of Apartheid legislation. Mandela had met many people across the political spectrum that were opposed to the South African government and was actively involved in mobilizing the masses and publically protesting against the South African authorities such as the Defiance Campaign. This led to him and other high profile ANC members being arrested and put on trial. On 5 December 1956, Mandela was arrested alongside most of the ANC Executive for “high treason” against the state and on 29 March 1961, after a six-year trial, the judges produced a verdict of not guilty, embarrassing the government. On the dawn of a new South Africa, it can be fairly said that Nelson Mandela was one of the pivotal figures in securing true freedom for people in a country that was dominated by a white minority for decades dating back 400 years when the Dutch seafarer Jan van Riebeek landed his ships in Cape. Inspired by Fidel Castro and the Cuban Revolution, the armed wing of the ANC “Umkhonto we Sizwe” (“Spear of the Nation”, abbreviated MK) was founded in 1961, with Mandela co-founding this wing with the long-time leader of the South African Communist Party (SACP), Joe Slovo and Walter Sisulu. Interestingly, MK agreed to acts of sabotage to exert pressure on the South African government, by bombing military installations, power plants, telephone lines and transport links at night, when civilians were not present. Mandela stated that they chose sabotage not only because it was the least harmful action, but also “because it did not involve loss of life [and]it offered the best hope for reconciliation among the races afterward.” Soon after then ANC leader Luthuli was awarded the Nobel Peace Prize, MK publicly announced its existence with 57 bombings on 16 December 1961, followed by further attacks on New Year’s Eve. The South African government however kept a close eye on the activities of the ANC and MK, and after raiding a property now famously known as Liliesleaf Farm in the Johannesburg suburb of Rivonia and arresting numerous high command figures of the ANC including Mandela, it resulted in South Africa’s foremost and famous trial starting on 9 October 1963. 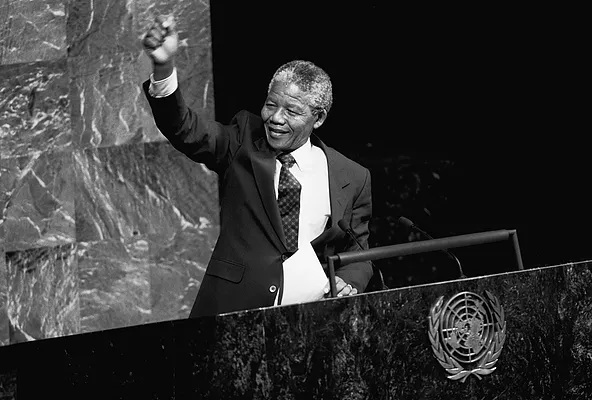 Mandela gave a now famous three-hour speech at the opening of the defence’s proceedings and the trial quickly gained international attention, with global calls for the release of all political prisoners from such institutions as the United Nations and World Peace Council. The South African government generally deemed Mandela and his co-defendants violent communist saboteurs, and on 12 June 1964, Justice Quartus de Wet found Mandela and two of his co-accused guilty on all four charges, sentencing them to life imprisonment rather than death thus sealing the fate of his incarceration on Robben Island from 1964 until 1982. After spending 18 years in prison on Robben Island Mandela was transferred to Pollsmoor Prison in Tokai, Cape Town in 1982 along with other senior ANC leaders – a measure by the South African government to remove their influence on younger activists. However, with mounting international pressure and sanctions against South Africa, increased MK attacks in South Africa together with support from activists from both within and outside of South Africa, economic stagnation and a change of leadership within the South African government brought about much sought after and significant change when the conservative president P.W.Botha stepped down and was replaced by a more youthful Frederik Willem de Klerk. With increasing local and international pressure for his release, the government participated in several talks with Mandela and with Frederik Willem de Klerk at the helm of the South African government, Mandela’s release was finally announced – on February 11, 1990 marking the day that Mandela’s release was announced, and with it the unbanning of the ANC and various political groups – a watershed moment in the struggle for equality and justice and democracy for all races in South Africa. On the dawn of a new South Africa, it can be fairly said that Nelson Mandela was one of the pivotal figures in securing true freedom for people in a country that was dominated by a white minority for decades dating back 400 years when the Dutch seafarer Jan van Riebeek landed his ships in the Cape. With the election set for 27 April 1994, the ANC campaigned on a Reconstruction and Development Programme (RDP) promising to build a million houses in five years, introduce universal free education and extend access to water and electricity. The party’s slogan was “a better life for all”, and Mandela devoted much time to fundraising for the ANC, touring North America, Europe and Asia to meet wealthy donors, including former supporters of the apartheid regime. The African majority voted overwhelmingly in favour of the ANC in a sweeping victory, and the newly elected National Assembly first act was to elect a new president – Nelson Mandela. The inauguration of the South Africa’s first African president and democratic South Africa in itself was a global event with leaders all over world from the opposite ends of political spectrum attending. But Mandela had no easy task ahead of himself – the new administration inherited a country with a huge disparity in wealth and services between white and black communities. Such was the greatness of the man that would leave a legacy for generations to come that Mandela had the vision and foresight to preside over the transition from apartheid minority rule to a multicultural democracy. He made national reconciliation a primary task of his presidency having seen other post-colonial African economies damaged by the departure of white elites and sought to calm the fears of whites within the country by reassuring South Africa’s white population that they were protected and represented in “the Rainbow Nation”, even incorporating opposition members into a coalition government. “Courageous people do not fear forgiving for the sake of peace” – became a very relevant saying by Mandela when he personally met with senior figures of the apartheid regime emphasizing personal forgiveness and reconciliation. There are so many milestones in Mandela’ life, from his autobiography of “Long Walk to Freedom” to his acceptance of the Nobel Peace prize, hence the greatness of the man of not only having achieved these by his own drive and ambition, but also because of the immeasurable benefit that he has left behind for mankind in terms of understanding the true value of his contribution to mankind. December 1997 saw Mandela stepping down as president and the ANC elected President Thabo Mbeki to take the lead. Mandela retired in June 1999 seeking a quiet family life and dividing his time between Johannesburg and his home village Qunu, but soon he reverted back to a busy public life with a daily programme of tasks, meeting with world leaders and celebrities, and working with the Nelson Mandela Foundation, founded in 1999 to focus on rural development, school construction, and combating HIV/AIDS. From 2011 onwards Mandela’s failing health attracted international attention but even after a successful medical procedure in early March 2013, his lung infection recurred and worsened, and he was re-hospitalized in Pretoria in a serious condition. On 1 September 2013, Mandela was discharged from hospital, although his condition remained unstable. After suffering from a prolonged respiratory infection, Mandela died on 5 December 2013 at the age of 95 at his home in Houghton, Johannesburg, surrounded by his family and his death announced on television by President Jacob Zuma. A country in mourning with the world participating – such was the profound grief felt in the hearts and minds of millions of people. Mandela was married three times, fathered six children, had 17 grandchildren and many great-grandchildren. Nelson Rolihlahla Mandela has come to be widely considered “the father of the nation” within South Africa, a founding father of democracy and national liberator, and it is common knowledge that during the last years of his life, he became to be regarded almost as a living Saint among the people of South Africa – his era “a golden age of hope and harmony” – such was the greatness of the man, leaving an indelible legacy and contribution to all mankind. Next Article The Underground Hub Of Arts.